Miss Cavendish has invited me to a cup of tea and a game of tag. A random game where I need to list "Six Random Acts of Quirkiness." Now does that sound positively delightful or what. Nothing could delight me more than these quirky little cakes Miss Cavendish made, that were sent to me for my birthday. They are exquisitely made and no calories. which fascinate me, especially in public spaces. 2. Must have a micron pen and paper near at all times to doodle or list with which to capture quirky gestures. 3. 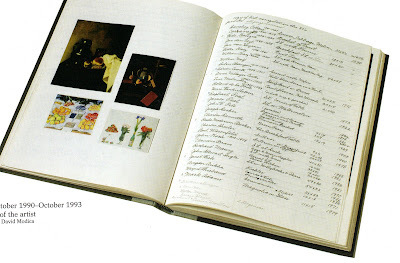 Intrigue with the "execution of craft" and a bit obsessed with how things are crafted. ie, how can an Hermes bag be $10,000, but I still would love to have one! 4. love white sheets and white towels. 5. lorna's natural moisturizer, i love it. 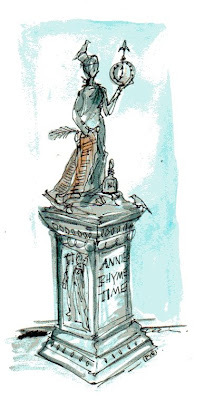 6. my epitaph, could it be one of my quirky drawings, a picture is after all worth a 1,000 words! Thank-you Miss Cavendish! Anyone on my blog roll who would like to divulge six random acts of quirkiness, please play along... I tag, Mrs.Blandings, Little-Byrd and Elements of Style. The word cozy conjures up images of an overstuffed chair, a hug from a loved one, the warmth from a blanket and a hand written note in your mail box. 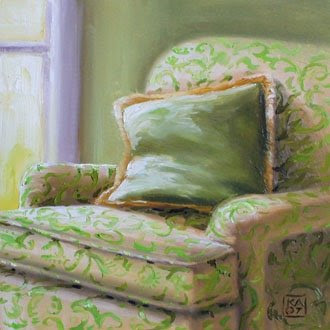 This chair was painted by artist Kimberly Applegate. Her name is even cozy and plush. 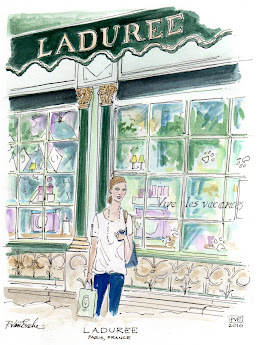 Her work has a true "joie de vivre!" 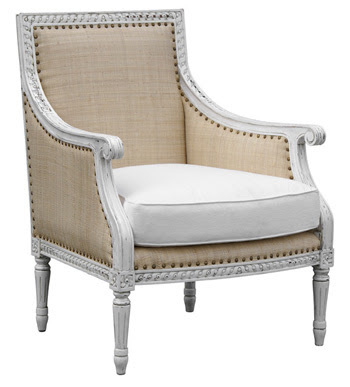 Do you have a "plushy" spot in your home, a comfy chair or something that feels luxurious? 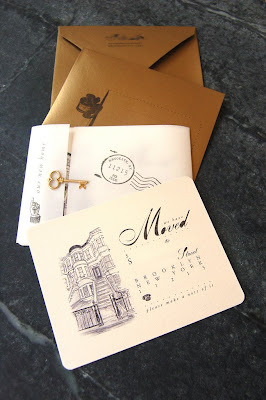 Nothing holds the key to my heart like a handwritten note, a card or box full of earthly delights. I love to curl up on my plush velvet sofa and hand write notes - to stay in touch or to send a thank-you note. I am pondering a wall of framed notes, stamps and all that I have saved. I have a weakness for anything green, anything paper, anything plush and of course anything that is made by hand by another artist. We need to support one another, right! I found this in my quest to live a plush life. Oh, did I mention, fabric, thread, glue, scissors are also included in my weakness area. I have such incredibly fond memories of learning to make my first dress in third grade and sewing with my Aunt Mary. I still have my sewing machine. Go on, live a plush life. You owe it to yourself or to someone special. My daughter wants to use it as an ottoman for her dolls. What a cozy and plush idea! 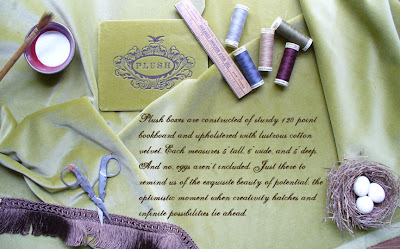 Here it is for those of you who adore robin's egg blue, nests, eggs, and creating an artful life. My children crouch in the back seat as I jump out, to lift my latest piece "from the trash" to simply liven up with a fresh coat of paint. Here are some ideas to get you thinking about that old dark and drab hunk of wood. I'm not saying that you should paint the 18th century mahogany antique, but an item that has seen better days will certainly benefit from a little paint. Yes, a bucket of paint, a brush and a space prepared to paint your item is all you need. 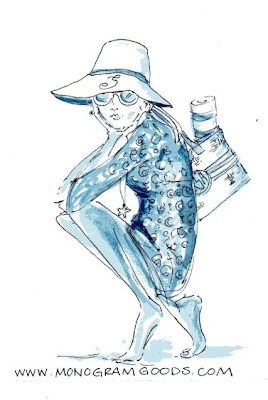 Transform something old, into something blue. 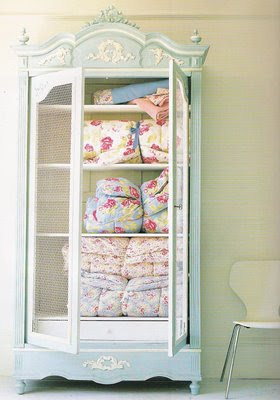 This cupboard is from Cath Kidston. I love the way she uses it to store linens, but it would be a great spot for china, books, or even art supplies. Flowers for mother's day, and a chair for her too. 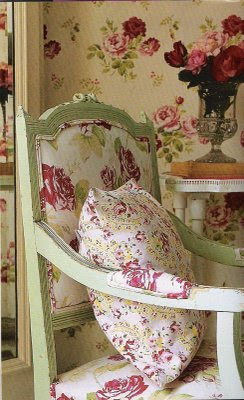 Paint a chair a gorgeous green, add some romance with flowers or your favorite fabric to add new life. 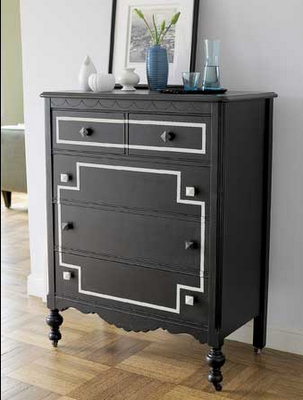 Black and white is always right, this chest was updated with a graphic white line and take note of the knobs. This photo was posted over at Elements of Style. My kinda style. Fresh, clean, easy and sharp. A fresh coat of white paint to me is like icing on the cake. 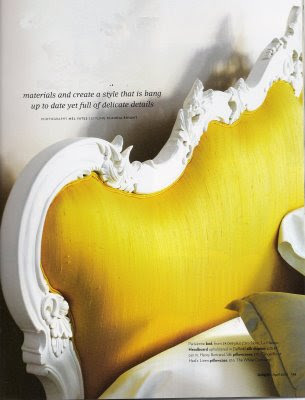 Paint adds a layer of freshness and the headboard in this sunny yellow shantung. Waking up to this would add a ray of sunshine even on the gloomiest of days! Be sure to take before and afters of your trash to treasures. See if anyone even notices, it is after all only paint and quite rewarding to say that you did it yourself. 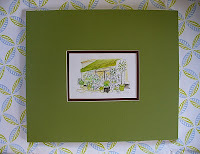 I will be posting some tips for you on painting made easy and painless. 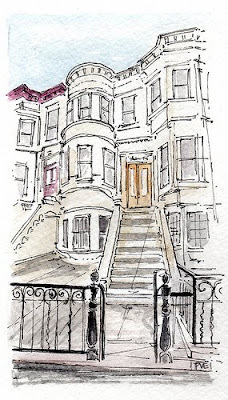 sent an inquiry looking for an illustration to be done of her Brooklyn Limestone. Stef sent me to take a look at the adventures of her place and needless to say I was moved by a renovation. (Not just any old renovation, Stef put up a blog to journal and document the before, after) -A not for the faint of heart or wallet sort of renovation, however, for those that are movers and shakers. 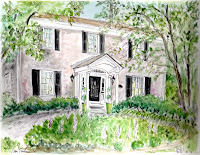 Here's my illustration of her home. One day, I clicked on Brooklyn Limestone, and I was shaken by the stressful photo showing some damage to the newly renovated, nearly completed Limestone, some sort of accident, a sewage back-up and I being the kind person that my parents raised, felt compelled to illustrate this home and send it to her. I truly believe that in every situation, there is a reason, a sort of silver lining. 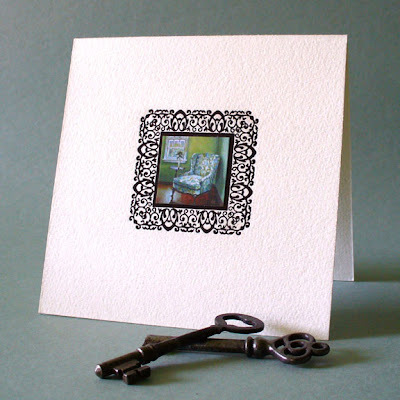 In return, the card with my illustration arrived in the mail and I was "Moved!" 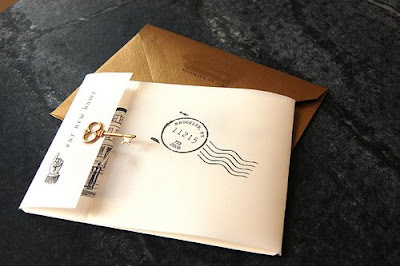 I mean the key, the vellum, the type and the gold envelope. Wow! Everyday, around me, I witness things that move me, things that shake me and give me inspiration to design, to illustrate and to live. Stef sent me a lovely box of chocolates too, and then this announcement which moved me. My children asked, where did you get this yummy chocolate, and I replied, from blogging. They say go ahead, blog all you want! Next time, try to be a shaker and move some-one with something unexpected. Expect nothing in return, just do it because it moves you. Stef posted about another "catastrophe" the other day, one of her missing cat. I am so glad that her cat came home, otherwise, a "hello kitty illustration" was on the drawing table. 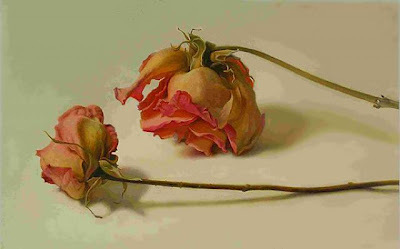 Artist Lawrence Kelsey paintings are on exhibit over at the Madelyn Jordan Gallery in Scarsdale, New York. Central Park, in New York City has been a refuge for many artists, "the soul of the city." Weekends are a time to put down the pen, the brush and let my eyes wander and be inspired by going outdoors, or to galleries or the River Arts Open Studio tour. I know what it takes to participate in this open studio tour and all the work it requires to prepare enough work to show. I hope to participate again, in a few years when I can devote time to this. Today, a family friday, we will be driving North, Hudson Valley to visit Storm King Arts Center. Five Hundred Acres of wide open land with sculpture. My idea of an artful heaven. This little book is calling me to take me home. Take me. Take me in a journal, and take me in a magic wallet. There's a checkbook cover too. 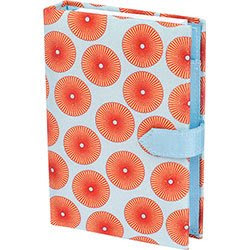 A fun journal from Paper-Source, a journal for weekends, especially if there is travel involved where I might need to write about something or do a "doodle." I Love the mix of colors. It would be on my nightstand, along with this "pillow" to rest my weary eyes. A nice little mattress for a mouse. Not that I am so matchy-matchy, but I can't help myself, these prints caused me to do a "double-take!" I could see an entire room and wardrobe in these fabrics. I know, I can't help it, it is the designer in me. Spring is for the birds. I am inspired to post about these lovely birds. I love hearing them sing and chirp early in the morning. These turtle-doves flew into our home and are quite in love with the spot by the window. They were a gift and made by hand - you can have your own birds, "Vrooman Woodcarvings" and wildlife gallery in Downtown Historic Truckee, 530-587-8104. (no web site) William Vrooman carves these beauties. 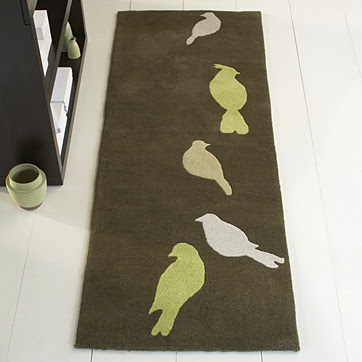 Love this runner for a hall-way, I like the graphic design and the colors, oh and the birds. I am not quite sure when my love for the birds began. Could it have been the Alfred Hitchcock movie, "The Birds" or that when I was a young gal my sisters called me "Bird-legs?" Above these two golden doves could easily fly anywhere into my nest. I found them at Oly Studio. 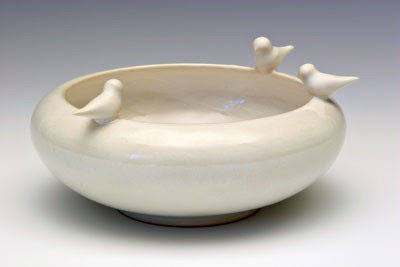 Bird-in-the-hand posted this sweet bowl from Whitney Smith. 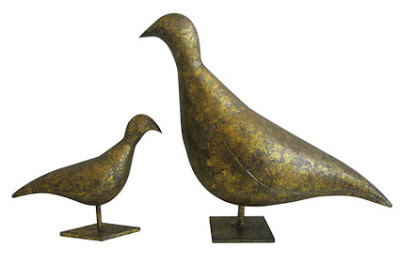 I would imagine these birds-in-my home and the three birds would symbolize my three children. Visit this little-byrd to take a peak at her sweet things, she makes such unique pillows and other items while raising a wee little one all from her nest. After all "chicks of a blog-feather must stick together! Do you have a penchant for the birds or the bees? My daughter recently gave a "scientific explanation" on How monkey's communicate at her school. Each student became an "expert" in their own topic and it was so much fun for me to see how each child worked to gather information and present it in a clear and concise presentation. Did you know that monkey's swing when they are happy and that they can sing and can be heard up to three miles away. All of the parents are still in awe of how the teacher was able to pull this off, as each child had their own unique area of study. Our little experts were donning white lab coats for a day as a "Doctor!" Monkey see, monkey do! 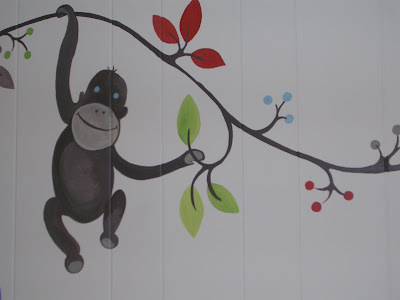 I painted this monkey for a for a nursery and this monkey is having a ball swinging from limb to limb. If this monkey were afraid, the teeth would be showing to show signs of fear. He is smiling and "monkeying around!" That is what monkeys like to do. As an artist, one of the things that I love are to paint things with a twist. This tree has the colors of all the Four Seasons. The bedding was from dwell studio (painted before they had dwell designs in Target!) 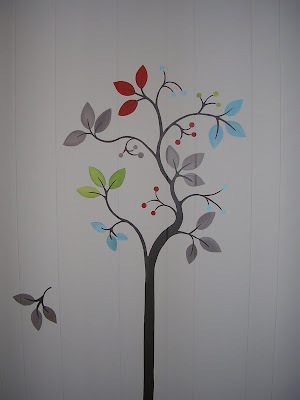 and I was inspired to mimic the leaves in the pattern and introduce several other colors to add to the palette to create a simple tree and some playful leaves falling about the room. A bit of blue sky is always needed, even on the worst of days. Flip the switch and Mr. Golden Sun lights up the room. I began to think in terms of time being elaborate and full, almost of having too much time rather than never enough. Did you ever imagine that time or a clock could be an elaborate one, a glorious one providing you with a "carpe diem" pendulum. Whenever I am feeling that there is never enough time, suddenly, there is not. However, when I give myself time, not to rush nor push, things always go all the more smoothly. 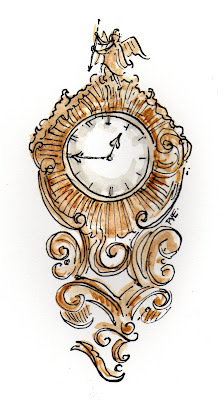 I illustrated this elaborate clock for each of you to print and hang in a spot to remind yourself to take time, quality time, and realize that the extra time you allow - will reward you with a few more minutes each day. After all life is not to be counted in the minutes, nor the days, but in the years. How do you make more time in your day to add years to elaborate upon your life? 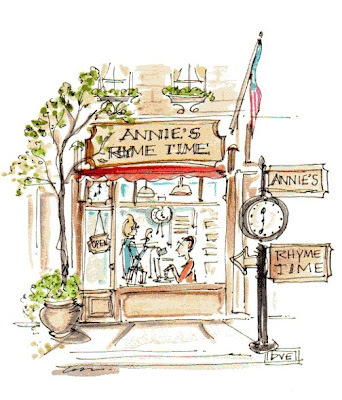 A client makes good use of her time, Annie's Rhyme Time. She writes clever jingles for all occasions or for just the "right time." 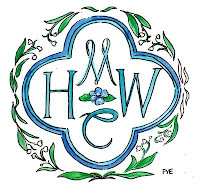 Check out her new web-site. I illustrated the virtual shop. Annie will always make time for you. 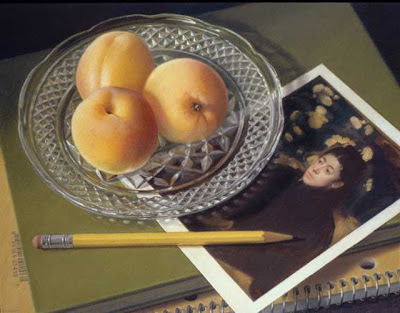 I am fascinated with the eyes and mind of many artists, but one artist that I admire is Mary Ann Currier. Several years ago, I had the pleasure of visiting an exhibit of her work at The Speed Museum in Louisville, Kentucky with my sisters. 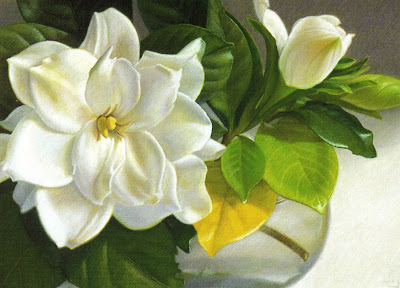 Below is one of her works, "Gardenia" and they look so real that one can almost smell the intoxicating aroma. A sense of refinement, an attitude of cultivation, an extreme sobriety. Below is one of her works, "Facing Downward" which fits every one of her goals. every line has a reason to create the form. 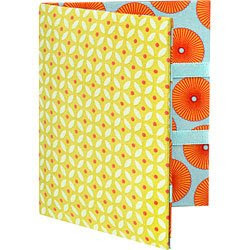 Do you keep a journal and do you list your goals? I hope I leave you inspired. 1. I was always aware of what was different. 3. Can you make me what Mrs. _____ made for dinner? 4. Can you buy me this_*______. 5. Can we have wallpaper? One afternoon at my friends home we ate "Matzoh." I always like to try different things. 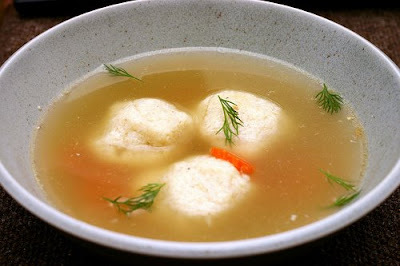 Her Mom made us Matzoh Ball Soup and when I got home, I told my Mom that she needed to learn how to make that. She did. I was fascinated to learn about other religions, cultures and their traditions. It's that time. Passover. 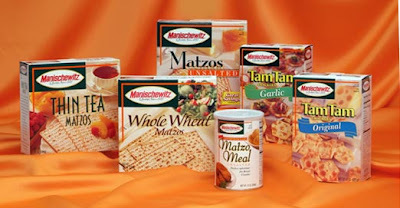 So, save me some Matzoh and Matzoh Ball Soup for this catholic gal. What are some of your earliest memories from childhood? Would you like to come to the beach with me. Come along and let those beach blues be gone. I love the beach. I love sand, water, shells, sun and the sounds of the waves and the birds. 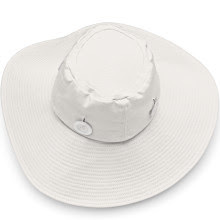 This White Hat with big buttons from Kate Spade to protect me from the sun and remind me to apply spf45 sunscreen from the harmful UV rays! Sunglasses from my collection. The bigger the better. Roberta Roller Tunic from Monogram Goods. 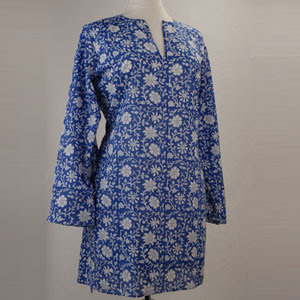 I would wear this with white jeans and sandals and it would make a nice cover up en route to the beach. 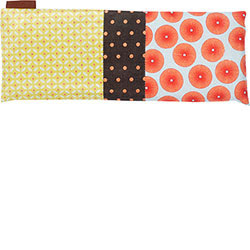 I have always dreamed of owning an Hermes Posh, Plush beach Towel. I think I would really have to think about parting with nearly a thousand dollars to lay that precious baby on the sand. I must admit that I am a little nuts over this elephant. Oh, and I would need a bag to tote all this to my destination. White, plastic coated & with a monogram speaks to my practical side. 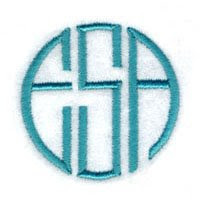 I quite like this monogram in blue in this contemporary circle. 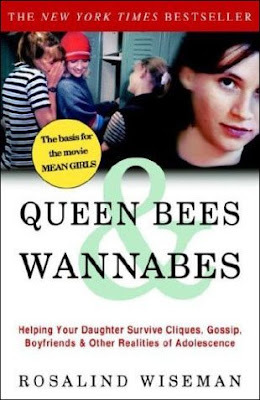 The book in my bag would be this one, Queen Bees & Wannabes to understand the perils of surviving in today's girls world. Rosalind Wiseman came to our school to speak, she was energetic, caring and powerful. Where was she when I was a girl. Let's work to support and help our girls to not be mean. Have you been watching the news? Unfortunately the beach is not right outside my door, it is about a 45 minute drive, however, I would settle for this pool house, right outside my door. 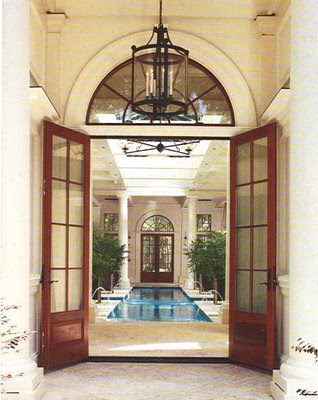 Architect Design posted this from Veranda and I cannot stop thinking about what a lovely spot for a party. A few laps, a little nap leaves me feeling so much better, so much nicer, that I have almost forgotten all about my beach blues. Fond memories of travels with my Mother and my Aunt Mary to the Carolinas and visits to the local shops conjure up visions of seeing sea shells made into sculptures, tiny people, wee little animals. 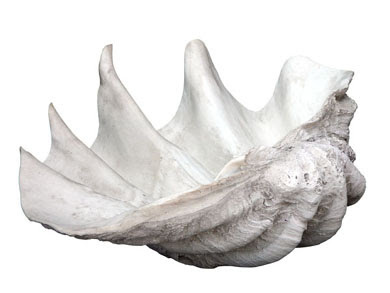 I would often repeatedly go back to the shop to visualize each shell and how easy it would be for me to make them. I say that about many things. My Mother and Aunt thought it would be easy to make them too and we dreamed of counting all our money, made from our shell creations. One is never too old to enjoy the thrill of finding a perfect shell strolling along the beach. A collection of shells framed and hung of Tahitian shells. 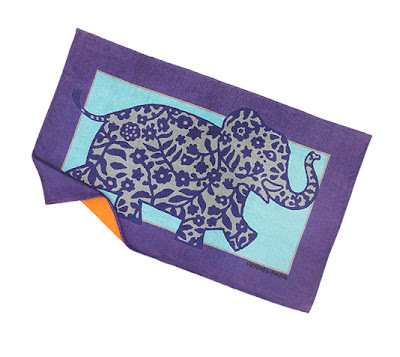 Placed or hung in a powder room they would take one away to the beach. Again, I find myself saying, I can so easily make these. Shells have often inspired many designers and artists as they light the way in these simple wellfleet sconces from Oly Studio. 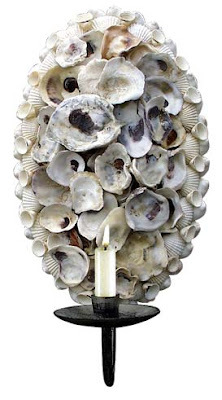 Oh, I can so easily make these too, for the beach house that I don't have. Yet. It would be entirely encrusted in shells, which I can so easily make. Just back home from the city where we attended an evening of the 100th Anniversary of the Foundation, Partnership with Children at the Pierre Hotel in New York City. I donated a "home" illustration for the silent auction venue of the evening and I am thrilled to say that the closing bid reached nearly $1000 dollars! I am thrilled to give to worthy cause to help support inner city children that benefit from amazing programs to give them needed counseling and education. Every child faces challenges in this life, and to partner with an organization that is devoted to giving and supporting children is a worthwhile cause. I encourage each of you to think of the future of our children. Thank-you! Oh, I absolutely adore room service and being known by name. Room service conjures up the life of Eloise as she proceeds to order something as simple as "one roast-beef bone, one raisin and seven spoons"- and instead she gets oatmeal. 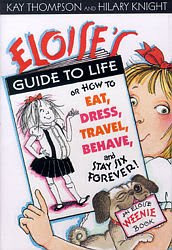 A girl after my own heart, eating, dressing, traveling, behaving and staying six forever. I love when she says, "Charge it to my room and make it snappy!" 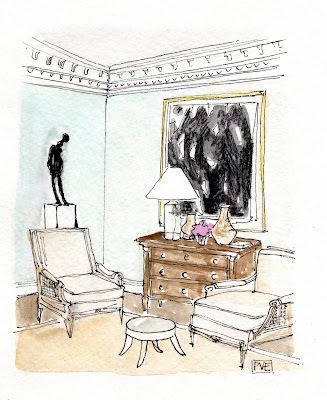 I drew a room with, two matching chairs, from Oly Studio, a chest, modern art, a statue, lighting and icing on the cake, the crown moulding. Freshly painted a tinted white, some cut flowers and a view which I leave up to your imagination, could be anywhere as long as it has a vista. A view or really magnificent books to provide an easy escape and room service. Don't hate me for dreaming, my life as an artist serves me well, dreams and drawings coming right up! Please excuse me, room service just arrived.